On the way yes but that’s a very early leek – 2d photgraphs not doing justice – visions June has glorious conversions and should not be missed ……..
I’m kinda feeling all the right boxes has been ticked in my book. This supplied with the new knights makes the rest of 2015 easy – I know what I’m bringing for Norway’s National miniature wargaming tournament in January 2016! Great. My Ordo Xenos Inquisitorial warband just took a significant torpedo amidships! Ordo Machinum manufactorum commence! Poor quality photo, but good enough to get me all excited. Yes! I have been totally preoccupied since the end of invitational, but thanks to this I might just start making models this weekend! Feeling it. I just “accidentally” bought some Sicarians and MAN this is an incredible kit. 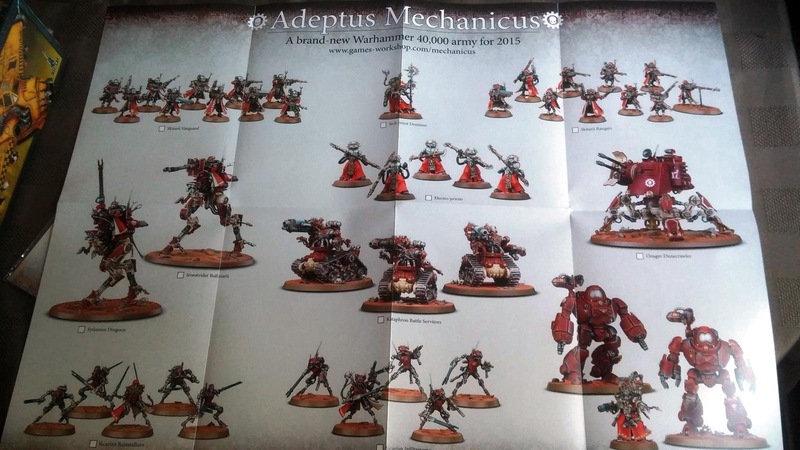 I have so much half-built stuff for my 30k Alpha Legion but the pull for a Scions/AdMech army with a Knight, Assassin & Inquisitor is just too much… Phenomenal. Amazing stuff! Can’t wait to see clearer photos, especially of the Dominus. I love all off the new stuff, and am now rethinking so many plans for future conversions. The robots would fit right in with my exo-suits (but that may be too obvious). And the tracked units will be so useful in so many different ways … one thing about an entirely new army like this is I am exited both by all the new amazing models and bits, but also by the new army list entries I can build counts-as models to represent. Totally! I am so excited about building some Martian treasures modified in the depths of the huge manufacturiums of Fenrys and figuring out what count as what. Even more excited about hopefully getting a game though. Really? Very interesting, they seem to be getting a lot of negative reactions, from what I’ve read so far. Well, for critics there is always the possibility to go Forge World. Now with access to better pics, I still can’t get used to the head. With models this bad (to my taste), I am always tempted to buy them, and try to convert them into something awesome. A simple head swap will completely transform the model and the rest is really good. 🙂 I still like him. It’s the Priests that are the disappointment in otherwise impeccable range. Next Post Hobby reboot 2015 – ORKS!! !